RC Airplane Propellers. How to select and prepare. 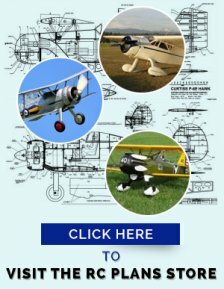 HOW TO SELECT, BALANCE AND CARE FOR RC AIRPLANE PROPELLERS. 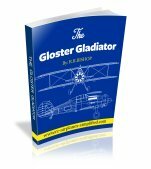 Many modelers ask the question-What size propeller should I use on my RC airplane? 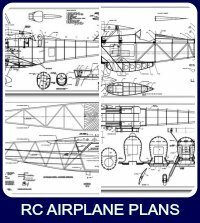 Well a good place to start is the RC prop chart from Top Flite Models. (See below). I think that use of the chart is self explanatory. Propellers are measured by the diameter and pitch. The pitch is the theoretical distance travelled, by the prop, in one revolution. The higher the pitch the higher the air speed and vice-versa. Of course the engine must have enough power to turn the prop faster! The ideal situation is to have a variable pitch prop, as per full size aircraft. Such a device is available, but it's use is confined to special applications. I believe it is used on some electric powered model applications. 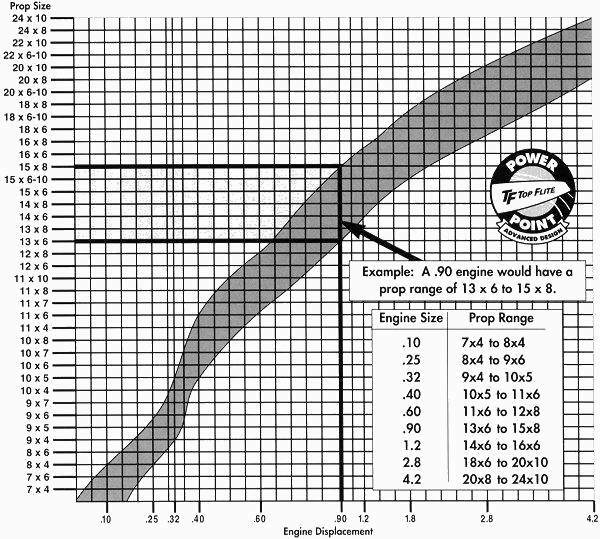 If a slower speed is required then a lower pitch and slightly larger diameter prop could be chosen. The engine manufacturer's recommendation is the other starting point. Always follow their advice! Once the decision has been made regarding the size of to try first then the next decision to be made is regarding the material to be chosen. The first radio controlled airplane propellers were wooden. A lot of modelers still use them and would not consider anything else! For a large range of light beech wood props visit TOP FLITE'S web page. The major problem with the wood propellors is that they tend to be fairly fragile. A less than perfect landing, with the prop tips just clipping the runway, usually results in a chipped or broken prop! On the other hand they are the least expensive of the types available. Synthetic material airplane propellers can be divided into two types-injection molded plastic and carbon fiber. I have been using APC injection molded airplane propellers for a long time and have had great success with them. They are well made and balanced and are available in a wide range of sizes and types. For more information, click here to visit their website. The carbon fiber RC airplane propellers are the latest in propeller technology. Generally used in the larger models, these propellers cost a bit more but for some applications they should be seriously considered. They offer the ultimate in blade stiffness and should have a long life. 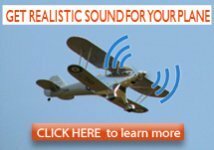 For further information I can suggest a visit to the Desert Aircraft website. They offer many types of RC airplane propellers, generally in the larger sizes, manufactured from both wood and carbon fiber. By far the most common number of blades used for RC airplane propellers is two. As in most things in life this is a compromise between efficiency and cost. Believe it or not, the most efficient RC airplane propeller would be a single bladed one! The single blade is operating in air undisturbed by another blade. It would have to be balanced by a weight on the opposite side of the prop but it should be easier to flip by hand! Three and four bladed RC airplane propellers are available, but will be less efficient than the two bladed variety. They are used if propeller clearance is an issue-as in some twin engine applications or simply for the look. They are seen in many scale model applications. Increase the pitch by 1 or 2 inches. The increased pitch should overcome the increased drag of the extra blade(s). The center hole in the propellers hub, may need enlarging to suit the engine being used. The hole needs to be a slip fit over the prop shaft. Too large and the prop will tend to be off-center and unbalanced, producing excessive vibration. It is not recommended to drill out the center hole in RC airplane propellers. If you must drill then please proceed very carefully and increase the hole diameter gradually, in small steps. The starting hole size, as manufactured, is direct on the center of the prop and you do not want to deviate from this position! 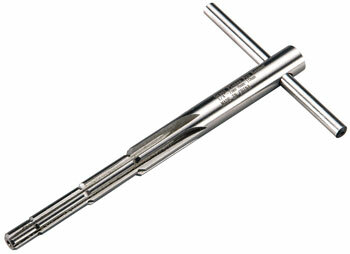 The much better and safer way to proceed is by using a prop reamer, as shown. The photo shows the Great Planes Precision Prop Reamer Std Shafts It has reaming diameters of 3/16", 1/4", 5/16" and 3/8"
Some of the larger gas engines use a multi-bolt propeller hub. The use of a drill jig makes this task a lot simpler. Check with the engine manufacturer for availability. The sample shown is from Desert Aircraft-click here for more information. It is essential to use a well balanced propeller. An un-balanced one will produce excessive vibration that will reduce the life of the engine and the onboard radio components do not react well to this sort of treatment! There are many types and styles of propeller balancers available but the one that I prefer is the DUBRO TRU-SPIN PROP BALANCER. All balancers strive to produce minimum friction that can effect the accuracy of the balancing. The Dubro unit uses large diameter precision aluminum wheels and a centerless ground balancing shaft. A unique feature of this unit is that there is no restriction on propeller diameter. If the unit is set-up on the edge of the workbench (as shown) then any size prop can be balanced. The prop is located between two accurate cones on the balancing shaft. As well as balancing RC airplane propellers this unit can also be used to balance spinners, helicopter rotor heads, fly wheels etc. To sum it up, the Dubro unit is an extremely accurate, well designed and manufactured, precision unit that can be purchased at a reasonable price. It should never wear out, so unless you kick it around the workshop, it should last a life time! To start balancing an RC airplane propeller, first ensure that the hub and hole are finished. The hole must be a nice slide fit on the engine shaft. It is possible that the hole in the hub is too large. In this case the hole must be sleeved. I have used K&S tubing, both brass and aluminum, to achieve this. Just cut the tubing to length and secure in place with Zap or epoxy. The first thing I do now is to take a fine grit sandpaper and remove the sharp edges on the leading and trailing edges of the blades. Remove just enough to prevent injury to your fingers and not too much! Now assemble the propeller between the two cones on the balancing shaft. 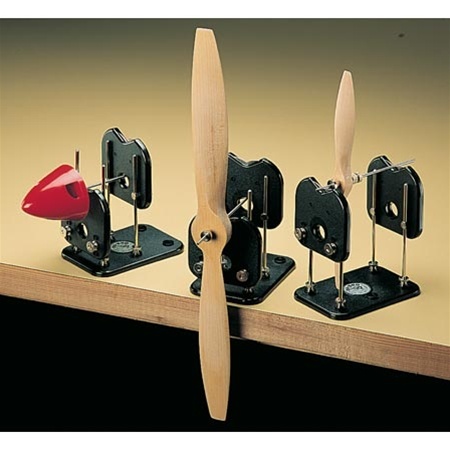 Place this assembly onto the unit, with the blades horizontal and observe the rotational action of the propeller. If the prop is balanced then it will stay in whatever position it is placed. If it is out of balance, then the heavy blade will rotate downwards. Now sand of a small amount of material from the rear face of the heavy blade and check the balance again. Proceed a little at a time until you achieve the perfect balance. If I am balancing a wooden propeller then a thin coat of Zap or fast dry epoxy is applied to the sanded area, to fuel proof it. Make it a thin coat or the propeller will be unbalanced again! Another method is to paint the tips with a fast drying, fuel proof paint. The light tip is painted with more coats, to balance the prop. Use a white or yellow paint and you can now see the propeller tips, when the engine is running! Many RC airplane propellers are equipped with a spinner. Their balance can be checked as well. First check the hole in the spinner back plate and the clearance for the propeller blades in the spinner cone. Make any adjustments as necessary, ensuring there is at last 1/16 in. clearance between the prop blades and the spinner cone. The spinner back plate can now be mounted between the cones on the balancing shaft. Now attach the spinner cone to the back plate and check the balance. Material can be removed with a Dremel grinder or the cone can be painted on the inside. I much prefer to use an aluminum, machined spinner. These are perfectly balanced as manufactured. For a large range of spinners and adaptors, visit the website of True Turn Precision Products. This video, from Horizon Hobby, gives all the details on the balancing of RC airplane propellers. It is quite long (13+ minutes) but is well worth a look. It does explain the difference between the horizontal blade position (for BLADE balancing) and the vertical position that is used for HUB balance. If you have a propeller with a crack or broken tip-please throw it away! (or use it for stirring paint!) The tip speed of some RC airplane propellers can be approaching Mach1! Do not compromise on safety! ALWAYS stop the engine by using the throttle or cutting off the fuel supply. NEVER throw a rag into the propeller arc to stop the engine. RC airplane propellers are HIGH SPEED ROTATING KNIVES. There have been some horrific accidents resulting from props, either from blades flying off or props hitting fingers and arms. 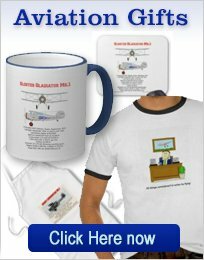 Make absolutely sure the RC airplane is safely restrained before starting. It is always a good idea to use a solid restraint and a helper. Please practice SAFETY FIRST when around spinning RC airplane propellers!